It's no secret that I love fall weather. I'm a grumpy hermit in summer, and when fall comes along, I am so happy. I also love fall nail polish colors, and I have been gravitating towards then since the weather turned hotter than the surface of the sun. 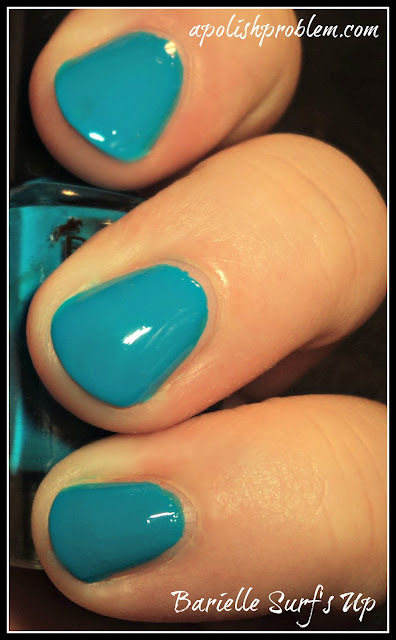 But, I am also beach-bound in less than a month (Cocoa Beach, FL... here I come) and I've been obsessing over our trip, so when I saw this beautiful ocean blue from Barielle, I knew immediately what was going on my nails for today's post. Surf's Up is an AMAZING, deep, cyan blue creme. I reminded me of my other favorite cyan or cerulian blue, Zoya Robyn, but it's actually deeper and more saturated than Robyn, so you could own both with no worry of dupes. It also leans a tad more teal than other cyan blues I've seen. Fair warning, though, this will give you smurf fingers when you remove it, and I did see a bit of staining, so you'll want to wear basecoat (I didn't) and even double up if you are prone to staining. Also, because it's so pigmented, it does dry a bit matte. I used one coat of Barielle No Chip Speed Dry to bring back the shine. Basically, Barielle hit it out of the park with Surf's Up. I love everything about it, and if you love blues, you really need this one. It's fantastic. Barielle Surf's Up is available from Barielle.com and, as always, Barielle polishes are buy one get one half. Though, you can pick up the entire Some Like it Hot collection for only $25. Products used in this post were provided for review. So gorgeous!! I love teal!